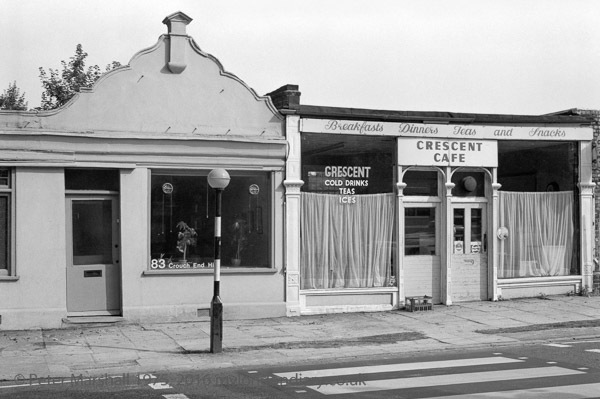 The second picture of the Crescent Cafe was taken on a separate film, but made within a few second of the first, and I think with a Leica rather than the Olympus OM1 used for the other image. I had been persuaded by Ray Moore and Paul Hill that a Leica might suit my way of working better than an SLR, and had bought an old and very worn Leica M2 body from Hove Camera, a specialist dealer in secondhand Leicas, at a cost of £170 (equivalent after inflation to £1024 now in 2018.) It was cheaper than the average M2 Leica at the time because of its condition, suggesting it had been through several wars. Its serial number tells me it was made in 1959. Many preferred the M3, but the great advantage of the M2 was that it had the 35mm frame line in the viewfinder (and the whole visible area was a pretty good fit for a 28mm) and that you only see a single frame line at at time. For a while I only had one lens for it, a collapsible 50mm f2.8 Elmar, which was an excellent lens, except when I didn't quite extend it properly, and made the camera just about fit in a very large jacket pocket. But the camera really came into its own later after I saved a month's pay to buy a secondhand 35mm f1.4 Summilux which was a perfect match. Hove Camera also published a series of camera guides, and although I think they stopped trading around 1999, the books which included republished Leica guides were acquired by Steyning Photo Books in 2007. The M2 is still in working order (I did once try to sell it, but because of its cosmetic condition the offer from a dealer was derisory) though it did need a rather expensive shutter service from Hove just over a year after I bought it. It still has that smoothly engineered feel that even more recent Leicas have been unable to match, and a better viewfinder. Fitting a cleverly engineered non-Leica rewind handle onto the knurled knob fixed the only real disadvantage compared to the later M4. The empty crate waiting for the next milk delivery by the door is definite evidence that, though closed, the cafe will be open for business for breakfast on Monday. The Crescent Cafe is still there, though it's shopfront has changed, obscured by a large name board and a metal shutter. It changed its name for a few years to SERCEM, but was back to Crescent when I passed it last year. The menu as Sercem hadn't changed a great deal, though a cup of tea was up to 90p and it also served a Turkish breakfast. The building to the left is now 'Cornucopia Express', and off-licence, grocery and greengrocers. The Crescent Cafe gets its name from Crescent Rd opposite, and these buildings were almost certainly connected with Crouch End railway station, possibly the station master's house. The station entrance to which was immediately to the right of the cafe.